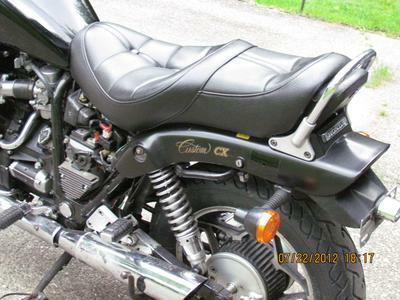 I have not one 1983 Honda CX650c for Sale but TWO (2)! Both of the bikes are in good condition. I'm riding the black one on a daily basis and the other one needs a new starter, clutch kit and lifters adjusted from sitting in a garage for a few years. The daily rider is in good condition. 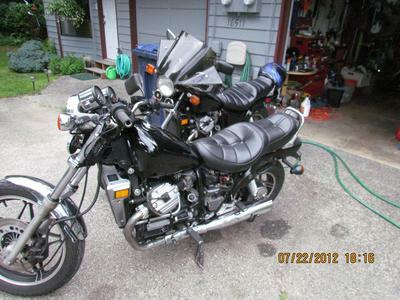 im a gal needing one bike,maybe less torque but both of these bikes are complete and crank up and ride. as well as gasket set, brand new pirreli rear tire and new front tire,brand new seat$250, or use her for parts, but she has great power and torque just the same. If you have any questions regarding either of the Honda CX650 Custom motorcycles for sale or if you would like to make an appointment for a viewing or payment and pick up using the space below that has been provided by Strike Lightning Used Motorcycles for Sale (and PLEASE do not neglect to include your contact information in your email or to provide a phone number or email address!) so that I can respond with answers to your questions as quickly as possible. 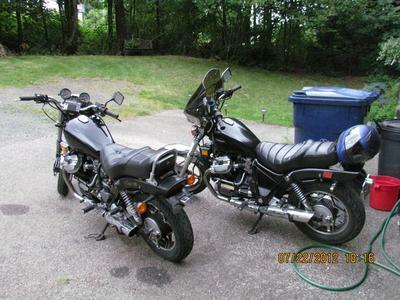 In my opinion there is not a better deal on a pair of used Honda CX650 custom motorcycle for sale in snohomish, Washington WA, on Craigslist or in an Ebay auction as this so hurry and make an offer before these two bikes get away from you! Strike Lightning would also encourage bikers to submit a review of the 1983 Honda CX650c for Sale to make the biker community aware of any problems that are commonly associated with the 1983 model or to highlight its positive features and help potential buyers make informed decisions. I will accept $4200 for both and don't forget to mention that you found this ad on Strike Lightning's Motorcycle Classifieds www.gogocycles.com in your email!